"What?" I walked to the back door, hoping that whatever Zane was excited about was not squishy or stinky. "There are lots of bugs outside, son." I started to turn around and head back to whatever I was doing, but Zane grabbed my hand. "No, Mom," he said as he pulled me outside. "Come see!" And there, in the middle of the patio, was this huge bug, legs up in the air. It was as long as my thumb, and very dead. At least, we hoped it was dead. You really can't be too careful with creepy crawlies. But I'm supposed to be the brave one in the family. After I established that the bug in question was not a giant cockroach(my persistent phobia), I flipped the bug over. A Rhinoceros beetle revealed itself. A beautiful insect, and I was sorry that it was dead, but secretly not so much. I explained to Zane that this was a perfect specimen, as it appeared to be completely intact. "You should take it to school and show your teacher," I said. Zane was skeptical, because he really wasn't convinced that the colossal beetle on the patio was actually deceased. It still retained that lifelike sheen, as if it were about to slowly shamble into the grass. 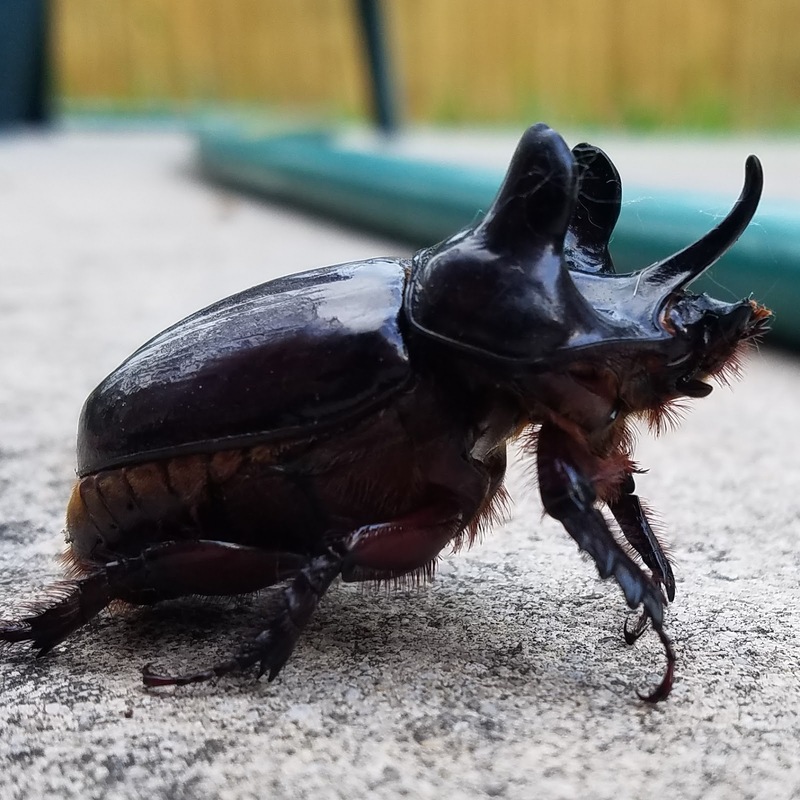 I got one of those plastic tubs from the kitchen, and used a stick to roll the rhinoceros beetle into it. Then I put the lid on and handed it to Zane. "Put it in your backpack for school tomorrow," I told him. Zane was now in a quandry. He wanted to be brave, like his mom. And he wanted the 'street cred' that he would get as a nine year old with a beetle on steroids for show and tell. On the other hand, creepy dead insect which might not actually be dead? In his backpack, possibly eating his lunch? Big negative, Ghostrider! My son and I share a fascination with insects and other creepy crawlies...from a distance. Like pictures in a book kind of distance. We enjoy watching bugs on television, for instance. Or bugs on the other side of the glass at the zoo. Bugs in the house, not so much. I know that my issue stems from straight up heebie-jeebies--the feeling of those little hairs on insect legs crawling on my skin! GAHHHH!!! It is possible that Zane has picked up on my anxiety. Kids are sensitive to such things. Or perhaps genetics play a role. All I know is that when there is a cockroach in the house, Zane and I are on the couch, feet up, while Larry dispatches the intruder. My boy sucked it up. He put the container with the big beetle in his backpack. He checked it three times before bed, to make sure it was still in the container. He checked it in the morning. I'm sure that he checked it on the ride to school, but I was driving. His teacher was suitably impressed, and Zane basked in the glow of teacher approval. "She said it was cool!" Zane told me on the way home from school. I told him that I was very proud of him for taking it to school. "Okay," he said. "Can you take it out of my back pack now?" Some things are better kept at a distance. I'm OK with bugs. I don't like to look in anyone's mouth. Which as a teacher, so many wanted to show me something in their mouth. EWWW!!! No, I wouldn't like that, either! I always love to read your blogs especially the style of writing like a story which has always a meaning. And you have suggested to your kid perfectly to bring a dead beetle in his school to show his teacher and to find out about the bug. Professionally I am assignment writer and hold expertise in providing help assignment UK to university students who are struggling in writing their academic writing tasks. And I love to read such kind of blogs. Nice story ! I really enjoyed this blog.